Nigeria’s foremost beach soccer organiser, Samson Adamu is at the head of an inspection team from Confederation of African Football (CAF), on a mission to check Egypt’s preparations for this year’s Cup of Nations. Although Nigeria Football Federation (NFF) president, Amaju Pinnick is chairman of the AFCON Organising Committee, Adamu has surprisingly turned up as head of the inspection team to Cairo. Adamu and the delegation began their mission at the weekend, as they began inspection of facilities for the 2019 Africa Cup of Nations, billed to hold this summer in Egypt, with an expanded number of countries. 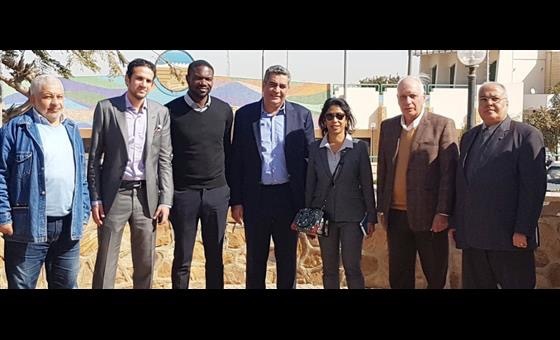 The CAF Director of Competitions and his team joined members of the Local Organising Committee with the stock taking of facilities and check of infrastructure in Cairo, one of the designated venues. The two groups will also discuss preparations towards the draw of the final tournament fixed for 12 April 2019 in the Egyptian capital, Cairo. The inspection team will assess stadia, accommodation, transportation, communication, medical, security and protocol, towards organisation of a smooth 32nd AFCON from 21 June to 19 July. Their first port of call was Cairo International Stadium, after which they moved on to other facilities in the Egyptian capital. The team will move to Suez, Ismailia and Port Said, before wrapping up with an assessment of facilities in the Mediterranean Sea resort city of Alexandria on Thursday.